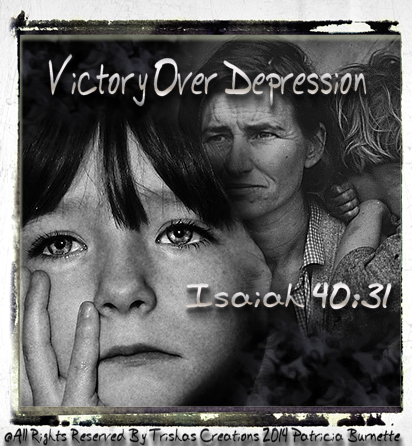 "You Can Have Victory Over Depression"
Welcome to "You Can Have Victory Over Depression"
Depression is one of the deceptive tools that Satan uses to try and paralyze God’s people and render them useless. Depression, is a feeling it cannot be explained. It's something which happens to us, and no one can determine the feelings it gives us. I suffered from severe depression before and I still do. Depression, is an emotion and a deep down problem and no matter how many times we try to explain to our families or the doctors, what we are feeling and thinking and going through, it can't be explained. Depression, is a paralyzing feeling, and it does destroy a person, they feel hopeless, useless, and sometimes it can lead to suicide and death of someone else. It hurts, it hurts families because they do not know what to do, or how to react to the one which is suffering from Depression. But, in God's word there is also help, and He gives us His word to help us, free ourselves from this demonized feeling which the devil pours down into our hearts and into our minds, and God tells us how we can control it and how to rid ourselves from it. When you sense that ugly feeling of loneliness and despair beginning to take hold use the word of god to come against it. The word will defeat the enemy every time.